Currently, Express Driving School is NOT a licensed traffic school but we are diligently working on bringing this service to our valued customers. We are licensed to offer online education and behind-the-wheel driver training. We are growing so expect to see it here on our website soon! In the meantime, we have partnered with Trafficschool101.com to offer an exclusive discount to friends of Express Driving School. Use our link on this page and you’ll receive 25% off when you sign up through our special offer (discount offer not valid to Texas residence). Why Trafficschool101? Well, for starters, they are the only reliable online traffic school that allow us to easily run promotional discounts. 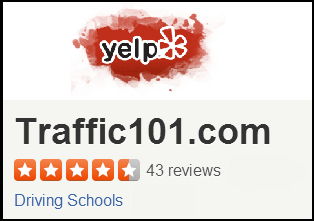 We’ve spent countless hours scouring the internet to find highly rated online traffic schools and their online program fit the profile. Don’t believe us? Check out some of their reviews on Yelp. There are no hidden fees and they offer a 100% money back guarantee. Avoid travelling to a classroom when you can clear that ticket online in the comfort of your own home or anywhere internet access is available.